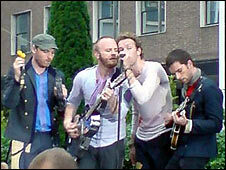 Coldplay showcased several tracks from their new album in an open air concert at the BBC Television Centre in London. The gig - broadcast live on BBC Two - featured new material such as Violet Hill and 42, alongside old favourites including Clocks and In My Place. 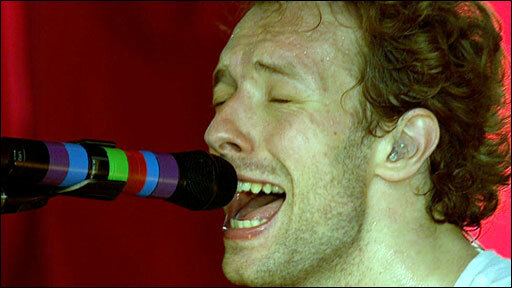 Coldplay's new album, Viva La Vida Or Death And All His Friends, topped the charts at the weekend. The band were dressed in military-style jackets, and opened the 45 minute set with new track Life In Technicolor. "How many of you are only here because you couldn't get tickets for the Weakest Link?" joked frontman Chris Martin to the audience of several hundred. Introducing the song Trouble, Martin said: "This is a song we wrote when we first came to the BBC - and never did we think we'd ever play it in such a helicopter-viewed, television extravaganza." He then altered the opening lines while singing to the sky: "Oh no, I see a helicopter's filming my friends and me/ I turned and stared - don't film the bald spot on the top of my head." The band left the main stage briefly to perform an acoustic version of Yellow against the backdrop of the Television Centre building. The gig ended with a rousing version of Lovers in Japan that involved showering the crowd with thousands of paper butterflies.